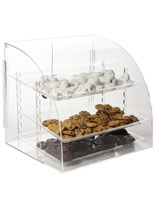 This Bakery Display Case Ensures the Dry Food Remains Fresh! 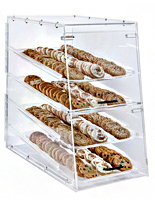 This Acrylic Countertop Stand Is Restaurant Equipment for Deli and Pastry Shop Use! 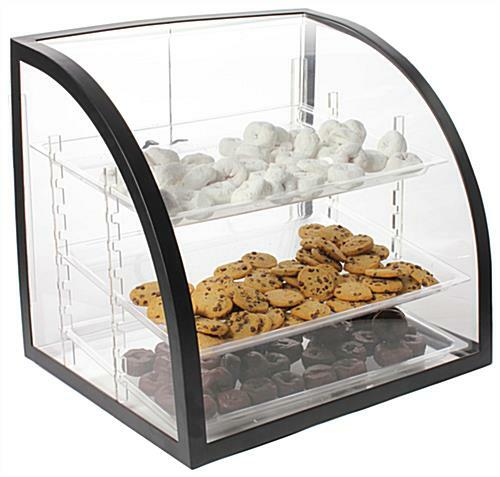 This Bakery Display Case Is in Stock! 3 Trays that can be removed come with purchase. Black finished metal trim matches most settings. Clear acrylic panels make contents easy to see. Two doors have hinges and handles for opening. 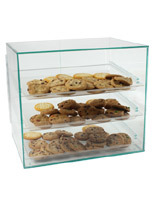 This bakery display case is the ideal unit for food storage and presentation. The countertop fixture uses metal handles for convenient opening. 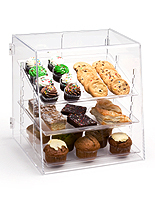 This bakery display case, also known as a pastry bin, includes three plastic shelves. Users are able to adjust the trays in height using the slotted sides. This bakery display case for a countertop looks great at the cash register and garners interest from customers while their completing the transaction. The acrylic food container includes polished edges for an attractive accent! 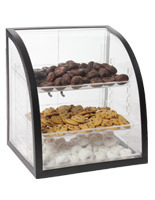 This bakery display case feature curved design and a metal trim. The curved shape provides a modern touch within the deli, café or other type of eatery. This bakery display case is capable of improving restaurant sales! The countertop fixture is a necessary piece of equipment. 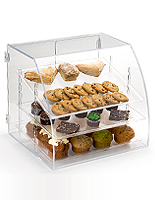 This bakery display case is a pastry storage device that will help increase business. 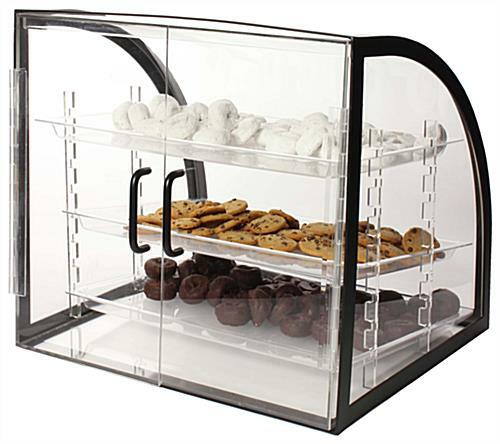 The restaurant equipment can accommodate all sorts of items including cookies, brownies, cupcakes and other foods. This bakery display case makes it easy for users to load or unload the content! There are two doors on the stand that may be opened quickly when necessary. 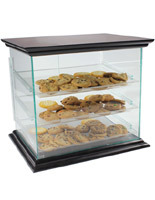 This bakery display case that has the adjustable trays has the black finished metal framing which encloses the exterior of the fixture. The bin takes only a few moments to set-up. 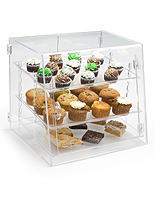 This bakery display case only requires users to slide the acrylic panels into the metal framing. The countertop fixture is a great choice.